In September 1986, after getting home from the job interview, I received news I’d been given the job at Pete Townshend’s Eel Pie Recording Studios in Soho, London. In November 1986, I was moved to the Twickenham studio and spent 3 years working as a studio assistant. In late 1989 I moved to Abbey Road Studios. After assisting on Tomoyasu Hotei's album in 1991 on a road trip to Rome, I stopped off in Montreux to visit him. He was mixing at David Richards’ Mountain Studios. David was the assistant engineer on ‘Live Killers’ and went on to produced the Queen albums ‘A Kind Of Magic’, ‘The Miracle’, ‘Innuendo’ as well as the solo albums by Freddie Mercury, Brian May and Roger Taylor. I was a fan of all these records that he had been instrumental in producing, which was an honor being able to spend time with him, let alone .I couldn’t believe I was getting the opportunity to visit the studio Queen had spent so much of their time. I walked into the studio, David & Tomoyasu were generous & warm in their greeting. Without asking, David put on the tracks he'd finished mixing. He played them loud and they sounded amazing. We then went out for dinner later that evening; I sat next to David and chatted about music and studios and our past. I knew his involvement with Queen, but remained quiet about it. He insisted that he knew me and that we must have worked together somewhere. I assured him that I would have known if we had. The only connection we had was that we went to school in the same South London town. I was working on a session at Abbey Road in studio 3. It was after midnight and the security guard entered the control. Unless you were involved on a session you weren’t to enter the studio or control room, so I thought something must have been wrong. He informed us a news flash had confirmed ‘Freddie Mercury’ had died at his London home. The session ended and on my emotional journey home I decided against visiting his house, which I knew was on route. I had no idea he was so ill although in hindsight, after seeing what would be Queens’ last TV appearance together 9 months prior collecting the Brit Award for Outstanding Contribution to Music, Freddie looked frail. Even Brian’s speech was uneasy. My friend Chesney Hawkes was managed by Trinifold. They also managed The Who. He invited me along to the Freddie Mercury Tribute gig at Wembley Stadium. Roger Daltry was appearing and Ches had a spare ticket. He only had one backstage pass though. This was overcome by him befriending the chap on the security door. Ches came out to meet me with his pass. He returned on his own and got in. I confidently flashed my pass and entered the ‘Hard Rock’ tented area. Ches beckoned me over from the other side of the room. He was signing autographs for a lady, her two children and their Grandmother. He introduced me to them saying I was a huge Queen fan. “This is Freddie’s mother”, Ches whispered to me. I remember saying to her that I wish we’d met under different circumstances and how deeply sorry I was about her loss and how incredibly proud she should be. I often wonder about her. The following day I was back at work. The band Extreme were recording orchestra overdubs in studio 1, which unfortunately I was not a part of. The singer Gary Cherone was in the queue for lunch in the canteen and was wearing a t-shirt with the ‘Hot Space Freddie’ silhouette and the words, ‘Life is Real’ below it. Pointing to his t-shirt I said the next lyric of the song, “Lennon is a genius”. He replied “living in every pore - you’re a fan too then”. We argued who was a bigger fan. I told him his bands’ set was fantastic the night before at Wembley Stadium, which he genuinely appeared pleased with. Later that evening I saw Brian May walk into their studio to say hello. In Spring 1993, I was in the front office at Abbey Road Studios. It was well after midnight and I’d left a session for a little break. As usual, I took a look in the studio diary to see what was coming up. I flicked through the weeks and came upon an booking entry “Studio 3 - QUEEN” for 2 weeks that was pencilled in. There was no further info than that. I put my initials next to the booking thinking there would be a rational explanation as to what the booking really was. I soon found myself on a 2 week session with Queen. My diary from 1993 is lost, so I have only a mental note as to when & what songs were touched upon at this initial stage of 'Made In Heaven'. We started taking delivery of various multitrack tapes on varied formats. These were then transferred to digital 48 track tapes for future work. Roger & John were alone on these sessions as Brian was touring in Japan. We worked in Abbey Road studio 3, which is a lovely large room to work in. If you sit in the right place behind the console, looking in through the studio you can see the zebra crossing beacons flashing. One of the playback & transfers we made was of the 24 track 2’’ 15ips multitrack tape of ‘Under Pressure’. The recording was made by David Richards at Mountain studios. For 30 minutes (the engineer) Noel Harris, Roger, John & I listened through to the tape as the song idea evolved. David Bowie’s vocal had been erased from the multitrack. You could hear Freddie on the tape and his ice clinking in what ever it was that he was drinking, excitedly suggesting his opinion. Brian noodled away at his arpeggio guitar part, John repeated his bass riff as Roger souped away at his hi hat pattern. Closing my eyes I imagined the recording taking place in front of me. After 30 minutes, the song had shape and form and the tape spooled off the tape machine. The silence was deafening and a stark reminder of where we were, without Freddie. I often felt the sadness and emptiness of not having Freddie around and it must have been torture for the band to have had to endure the constant reminder. Over the 2 week session, Roger would suggest we went out for dinner. We had 3 or 4 meals out at a local Italian restaurant. Even now I laugh at jumping into the back of Roger’s Mercedes and the four of us driving down Abbey Road to the restaurant. It was owned by an Italian lady who would force you to smell her ‘wonderful mushrooms’ from a jar, which she made Roger do. At our initial meal she told Roger he looked familiar. “Well, I’m in a band and we’ve been on TV before.” Roger replied. John seemed calm with the lack of recognition. “What group do you play for?” she asked. “I’m the drummer in a rock n roll band called Queen” he replied. This now has more punch than it ever did if you’ve heard Rogers’ album ‘Fun On Earth’. “No - I don’t hear of this band” she replied. We finished our food and the bill was called for. It showed up. John took it and asked Roger if he should use the Queen card to pay for it or his own card. I found this more amusing than Mama Rosa not knowing who Roger was, let alone not knowing about Queen. Roger’s drum kit arriving half way through the first week of sessions was a surprise for Noel Harris (the engineer) & me. We expected the sessions to be playing back tapes and working through the various formats to find possible material to be worked on at a later date. Noel was unfamiliar with the room in studio 3 and asked my opinion where to set the kit up and what microphones I would use. Eventually he left me to it. The kit was positioned and I mic’d it up that evening. John had his red Fender bass DI’d (no amp was used) and sat with us in the control room. I doubt these recordings made it through to the final mixes; it’s nice to think that they did. The pleasure I take from the whole situation is having experienced first hand Roger & John working together. The track sheets from the recording sessions will document what was recorded on these sessions, but at a guess we worked on recordings for ‘It’s A Beautiful Day’, 'I Was Born To Love You', 'Made In Heaven' & 'Heaven For Everyone’. There was a keyboard session with string/synth overdubs. I can’t remember what song it would have been but Mike Crossley played and John was producing. I met Mike again years later at The Borderline venue in London where he was the in-house engineer. Roger’s PA, Martin Groves, was very kind as he lent me a Vox AC30 amp for my first gig after the Queen sessions had ended. It was at the ‘Rock Garden’ in Covent Garden. He knew I didn’t have an amp for the gig. I often wonder if the amp I was lent was ever used by Brian, or just a stock amp that was one of many. I left Abbey Road and started working for the Virgin Studios, which included The Town House Studio in Shepherds Bush. 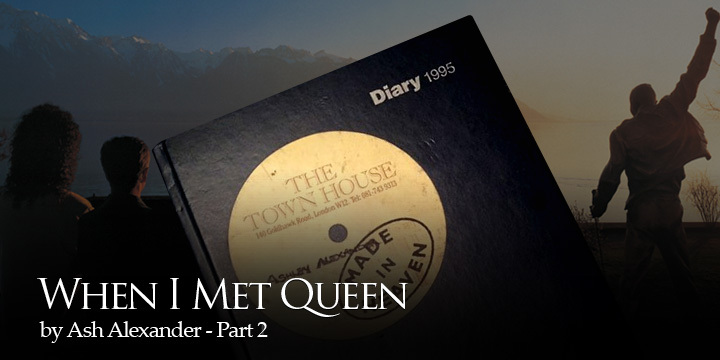 In mid August 1995, while looking through the studio diary 'Queen & David Richards' were pencilled into studio 1 for 2 weeks. My initials were on it within seconds. I received a call from David Richards a few days before we were to start. I was told he was going to call and go through a few technical bits. I was nervous about working with him. I was instantly put at ease when he called. We chatted about meeting at Mountain Studios and that he remembered me. The call was just to touch base with what we were going to be doing. I told him that I’d worked on the initial stages of the album at Abbey Road and couldn’t believe I was going to be involved in the final sessions. He asked what I’d been up to and what I was doing for the weekend. I’d been busy on back to back recording and mixing sessions so had booked the Saturday off as a friend was getting married. He wanted to start on the Saturday, but said it was more important I went to the wedding. He insisted that we’d start on the Sunday - “If that is ok with you”? I later learned the album had to be delivered by the end of the month. The album was released in November, so there was only a 4 week window to manufacture the CD after we had finished the final recordings, mixes & mastering. During the afternoon Brian’s guitar and a Vox AC30 amp appeared in the studio, brought in by Brian's guitar tech Pete Malandrone. We were to do guitar overdubs on ‘You Don't Fool Me’. David asked me to put two Shure 421 microphones pointing into the back of the speaker cabinet. We did have two SM57’s on the front but these weren’t used in the recording. I had to do a recall of the mix, which meant noting all of the studio outboard settings so we could get back to the mix and finish it off. Brian put on his guitar that was linked to his amp with one lead. No pedals. His sound was instant and we were soon ready to record. He stood in front of the console in the control room facing David & me. Brian had an idea of what he wanted to play. The guitar riff had already been recorded. The solo guitar is what was added. Brian used a scrap of paper that he drew a map of dots on. Not like musical notation but his own short hand. Being this close to Brian reminded me of being at the 'Radio Ga Ga' video shoot 13 years earlier. I was the same distance from Brian as I was then, but the scenario was beyond my imagination. 21.00 - 24.00 - You Don’t Fool Me - Guitar overdubs. 11.00 - 17.00 Downtime - 3348 Tape machine swapped. I was in the studio on my own this evening while I made copies of some Dat tapes. Brian's guitar was safely kept in the control room. I did have a look in the case... I opened the lid but was too scared to pick the guitar up, let alone play it. 11.00 - 20.00 - You Don’t Fool Me - guitar overdubs / Comp. At 3am David suggested I go home as he was only programming. I left him to carry on as I got the feeling he was more comfortable on his own. I think he will have spent more time on 'Track 13'. Day Off - I may have met Pete Malandrone and a friend at the Sun Inn in Barnes this afternoon. The Queen International Fan Club was based round the corner at the time. Brian had a house in Barnes too, although I'm not sure he lived there at the time. Pete sat near the front window of the pub and kept looking out of it. I asked what he was looking at and he replied "I always get worried when I'm out with Brian's guitar. It's in the boot of the car you see." He stayed for one drink and decided it was time to leave. One of the evenings of this second week, George Michael came to visit. There was a strong possibility that he would sing on one of the songs. Roger, John, Brian, David, George & I sat chatting in the control room. One of the conversations moved onto the Beatles and their current 'Best Of' release. I think Brian suggested that it was a bad idea releasing all their old material and I piped up that the fans would buy it regardless, much like the scenario Queen were about to face with the imminent release of the album. There was a deathly hush as I realised what I was saying. I wasn’t being at all derogatory. I was helped out of the hole I was digging by George who agreed with me and we moved on. No one actually spoke about George doing a vocal. 'It’s A Beautiful Day (Reprise)', 'My Life Has Been Saved' & 'Track 13'. The other tracks had already been mixed. I think we will have worked on this as we finished so late. David Richards had constructed the track at his own studio, he was using a new piece of gear called an ASR 10 (rack). It was a sampler / sequencer that had reverbs, filter and delays built into it. He was amazed with it and had clearly spent time experimenting with its capabilities. I can't remember how much of the track had actually been pieced together but programming and recording did happen on this session. I remember we used an AMS delay for a few of the effects. We fed in a signal from tape and the return was fed back in an endless regeneration of delays. 20.35 on the piece is an example of this. David chased the regeneration on the AMS delay and recorded the output. We also had a handful of vocal samples of Freddie. David let me set the samples up in an Akai S3000 and then recorded me playing them throughout the piece. This was played to and then amended that evening by Brian, which is what you hear on the album. I dropped David back to his hotel in Chiswick after most sessions. It was on the way home for me as I lived in Barnes. I was the luckiest person in the world knowing that I was going back to the studio in the morning to work with Queen. Nearing the end of the 2nd week, we started talking about David’s work on earlier Queen albums and in conversation I told him about my Queen journey. He was so happy for me. He’d too had worked with his musical heroes and understood how it was for me. I think I made his day by singing something from 'Fun In Space’, I can't remember what it was but it might have been from ‘Interlude From Constantinople', he was so thrilled. (I think those RT albums were more influential in my own songs / productions that the Queen recordings were.) He was amazed that I’d not said anything before. We touched on Queen discussions after this, but I decided to stop as David became emotional one evening when he was describing working with Freddie. It was heart wrenching, you could tell how much the Queen family meant to David. I reached out to David by Email on April 1st 2010 and had an instant reply. I worked at Abbey Road on the first 2 weeks of Queen's 'Made In Heaven' album & the last 3 weeks with you at the Townhouse Studio. I just wanted to touch base with you and send you my best. We initially met at Mountain Studios through Hotei who I came to say Hi to when you were mixing for him. If you are ever in London, I would love to hook up. I remember you as being extremely helpful, kind and discreet. And talented.! I've been lucky and was thrown out of the Mountain Studios in Montreux ( I became the owner, after Queen) six years ago due to inherited rental disagreements. The result was that I was forced to find a new solution for having a recording studio. I found, by chance, a beautiful villa in the hills above Montreux and converted it into a studio plus a place I could also live in and invite a few artists to stay the night or two. (there are six bedrooms,although I have taken over several as recording rooms.) This cut all my costs into less than half. I kept the name, Mountain Studios, and although it was slow to start up, it is now in so much demand I am overwhelmed with work at the present time. This has led me to develop the enormous basement below the house, which has almost the same surface area, into a second studio facility. I have had trouble delegating and finding the right people in Switzerland to help me expand the obvious potential that I have. If you would like to visit us here and see the potential, you would be most welcome. I have been waiting for you to contact me. The opportunity to visit David at his studio in Switzerland never arrived and to hear he died recently after a long illness filled me with sadness & regret. I’ve recently been involved with remastering & editing material recorded by David from the Montreux Jazz Festivals over the years. The list of artists he recorded is incredible and his involvement with them clearly set him up with a vision of sound that few others will ever have the opportunity to encounter. Nearing the end of the Townhouse sessions, Brian May asked me if I’d been involved in the Abbey Road sessions. I said “Yes” and he immediately picked up the phone and mentioned my name to the person on the end of the line. The following morning, Roger greeted me with ‘Good morning Aardvark’. Brian had credited me under 'special thanks’ and because it was in alphabetical order, I was on top of the list. The album art work was signed off that day, there were no samples of it in the studio so I had to wait until the album was released before I could be sure I had actually made it into print. I decided to tell John about my journey. Again, I summarised all you've read here including our quick chat at 'Radio Ga Ga's' video shoot 14 years prior (about how to get into studio work). I thanked him for all he & Queen had done and couldn't believe I’d now worked with them. John replied by asking me if I knew Tristan Powell. (Tristan is a good friend of mine from my Abbey Road days). He told me it was because his wifes’ friend fancied him. I was floored and still am. He made the whole fame / rock hero myth look rather ridiculous. He didn’t do it in a belittling way, but was being sincere about it and perhaps felt more comfortable with common ground. I compiled a 1/2'' album master in preparation for the first complete playback. Brian, Roger, John, David & I were in the dimly lit control room and the mood was relaxed. At the end of the second playback, I had a sense of sadness that the project was at an end for me, but more so a feeling of sadness for the band. We could hear Freddie singing and at times it was as if he’d been in the room with us throughout, but the stark reality was that he’d gone. I certainly felt an emptiness. The final playback party that I thought would be a star studded affair, was in fact a quiet affair. The band weren’t present, I don’t think David Richards was either. I did get to hang out with dear Jacky Smith who was there for me at the beginning of this story, so perhaps being with her here was a fitting end. The album was released and it is only now I realise the time scale. The album was mastered from the 1630 master tapes on about September 21st - which meant there were only 6 weeks before the album was physically released to the world. There was never a sense of time pressure within the control room at the end of the album which shows what a professional David Richards was. I’d had a brief conversation with Roger nearing the end of the Townhouse sessions. He asked what I was next up to next and I told him my plans to leave the studio world and focus on my own songwriting. I’d written and recorded quite a few songs by then (all at Abbey Road in down time). He asked me to send him my demo tape and later invited me to visit him at his studio down the A3 for a meeting. After leaving the studio world to follow my songwriting & band path, I was driving home late one morning after one of my bands Camden gigs. We had played the Underworld and the usual low of driving back with my gear in the boot of the car was kicking in. As I drove through Hammersmith towards Chiswick there was a car infront of me that grabbed my attention as the silhouette of the driver was familiar. It was Brian. It made me realise how far away from making it as a band I was. I sent an email to Brian around 2001. I've lost the email which I regret. I reminded him about the sessions and thanked him for being as thoughtful to credit me on the album. His reply was quick and was happy to give credit where credit was due. We had a few exchanges of thoughts and he spoke about his future musical plans for 'We Will Rock You'. Queen+ Paul Rogers played their first show together at Brixton Academy. My friend Chris invited me along. His wife is friends with Anita Dobson. We arrived at the venue but had trouble getting in as we didn’t have tickets. We eventually had a call on Chris's phone and were soon met outside of the backstage door. We were ushered in and upstairs to a bar. Anita was very kind and welcomed us in. She was soon told I was a huge fan of Queen, which she played upon. Familiar faces were in the bar including Brian. Justin Shirley Smith & Pete Malandrone were there and we spoke briefly, Pete referring to me as 'Aardvark Alexander'. Jacky Smith was there too and she said she couldn't believe I was there... neither could I.
I did a mash-up of 'Don't Stop Me Know' with The Black Eyed Peas song 'I Gotta Feeling'. The idea grew and I decided to finish a version in hope that the Mercury Phoenix Trust could benefit financially. I reached out to Brian as without his support there would be no point for a commercial release - unfortunately he said 'No' and in hindsight I'm so happy he did. I thought at the time the shows Queen were booked for that summer would not happen. They were to play a summer festival that fell through. I rejoined the Fan Club thinking a special event may happen and there would be advance ticket sales for the members. This was the case & I soon found myself outside Hammersmith Odeon about to see Queen, this time with Adam Lambert singing. I went with my brother Bruce (who was dragged along to the Milton Keynes with my Mum when I saw them in ’84). We arrived after the queues and caught sight of Anita Dobson. I approached her to say thanks for being a kind host at the Brixton show. Perhaps I was overbearing and the pre-gig beer and excitement had given me extra bravado, but my intent was genuine. Bruce & I got to our seats. We were in row 'Z'. It was the last row in the circle. It was great being in the gods looking down rather than in the front getting squashed. We actually stood in the aisle behind our seats for the whole gig with a clear view of the stage. The show was awesome and I felt that I'd come full circle. I was a fan again lost in the moment of 'Brighton Rock' just as I was listening to 'Live Killers' when I was a kid. I attended the first night of Tim Rice's West End Musical, 'From Here To Eternity'. Sat next to the side aisle, I reacted to Roger Taylor approaching me with a familiar nod and wave. He acknowledged me though he had little choice as he had to pass to get to his seat. I stood up to say hello and we shook hands. I said “I'm Aardvark from Town House Studios. I worked on Made In Heaven”. He said “Yeah, yeah. I remember you.” Rather than striking up a conversation, I decided to cut it short by saying it was great to see him, wishing him well with his new album and neatly sat down. And this was my Queen journey.